Governor K N Tripathi, who visited the site, described it as "a big disaster". "I have come to see the rescue work. It is a big disaster. I heard that maintenance of the bridge is entrusted with the PWD and the railways. The matter required to be enquired," he told reporters. 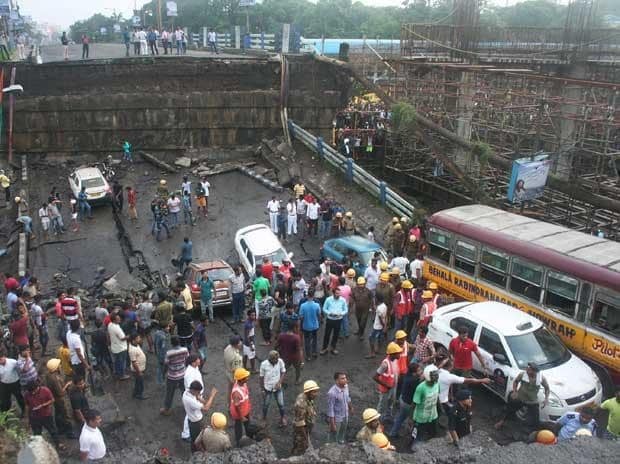 The over 50-year-old bridge in south Kolkata caved in around 4.45 pm during rush hour claiming one life, trapping several people and crushing many vehicles. "It is really unfortunate that the bridge has collapsed. But the fact is the state government is solely responsible for the bridge collapse. The issue of repair of the old bridges is not at all in the agenda of TMC government," senior BJP leader Mukul Roy said. State Congress president Adhir Chowdhury demanded an "answer" from West Bengal Chief Minister Mamata Banerjee and Public Works Department Minister Firhad Hakim. "Earlier in 2016, we had witnessed a bridge collapse (at Burrabazar). This incident proves that the state government is yet to learn its lessons. The state government should give an answer," Chowdhury said. Reacting to the allegations, Hakim said this is not the appropriate time to indulge in "politics over the incident". The chief minister who is on a visit to Darjeeling now has ordered a probe to be conducted by Chief Secretary Malay Dey. Banerjee also announced a compensation of Rs 5 lakh to the family of the deceased and Rs 50,000 each to the injured.